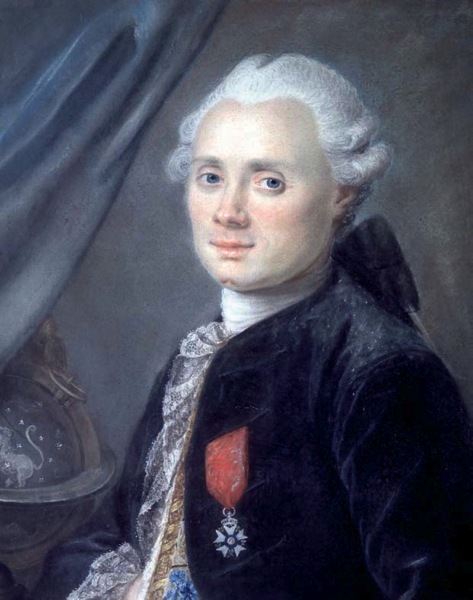 Charles Messier was born in 1730, in France, and grew up to be a comet obsessed astronomer working in Paris. To be fair to Messier, most 18th century astronomers were obsessed with comets since discovery could bring fame and riches. Whilst hunting for these bringers of wealth, Messier kept finding himself confounded by other objects that appear non-stellar, but lacked one of a comet’s defining features: they weren’t moving. Whatever they were, they weren’t what Charles was devoted to. It’s curious then that Charles’s lasting claim to fame is the Messier catalogue in which he listed 103 ‘nebulae’ – a definition that included almost anything that wasn’t a comet or clearly stellar – with 7 more being added after his death. The thing about these 110 objects that might look like comets, but aren’t comets, is that they were objects not to confuse with a comet and as such, in binoculars they’re generally not impressive. 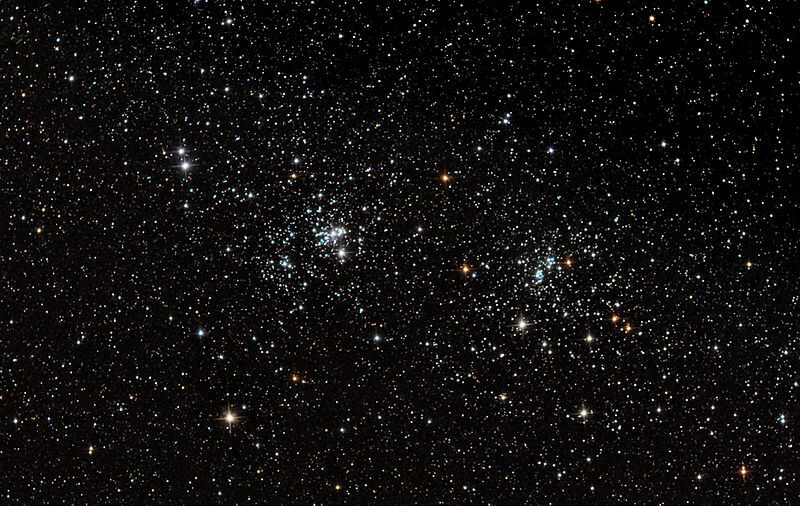 The main exceptions tend to open clusters due to their looser stellar nature. Even so, many fail to break the fuzzy blob mould even with the benefit of modern optics. Perhaps binocular astronomers are getting a good impression of what Charles Messier saw when we’re looking at globular clusters in the 15x70s. They’re little more than faint fuzzy object with a brighter core… perhaps. It’s noticeable that many of the best binocular astronomy targets were ignored by Messier completely, but perhaps it’s not a surprise. 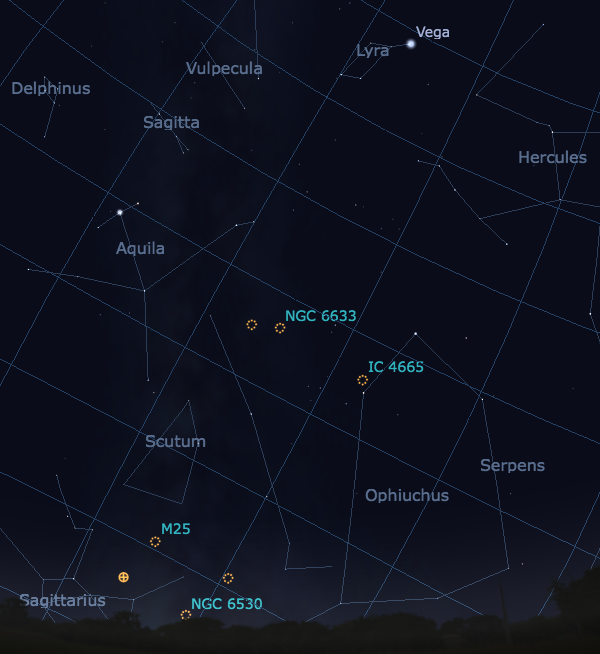 With his goals in mind, he was hardly going to mistake the double cluster (NGC 869 and NGC 884) above for a comet. They neither display background nebulosity, nor appear as a nebulous object as so many globular clusters have a tendency to do in antique telescopes and binoculars. So what’s the interest in Messier’s catalogue? Observing the Messier catalogue with binoculars is mostly an exercise in finding things. Most of these objects stand out well from the stellar background with a reasonably dark sky; that’s why they’re on the list in the first place. Finally, a pair of binoculars is very compatible with this activity. Many of the Messier objects are near the horizon from the UK as Messier was working further south. Additionally, dark skies can be hard to come by to finish off those faint galaxies. So to locate the lot you’ll probably need to move around, which is home turf for binoculars. I might sound disparaging about Messier’s objects. He certainly had no interest in them, however some of them are really beautiful, even in binoculars, take M45 Pleiades for example. But to see many of them at their best you need a telescope. 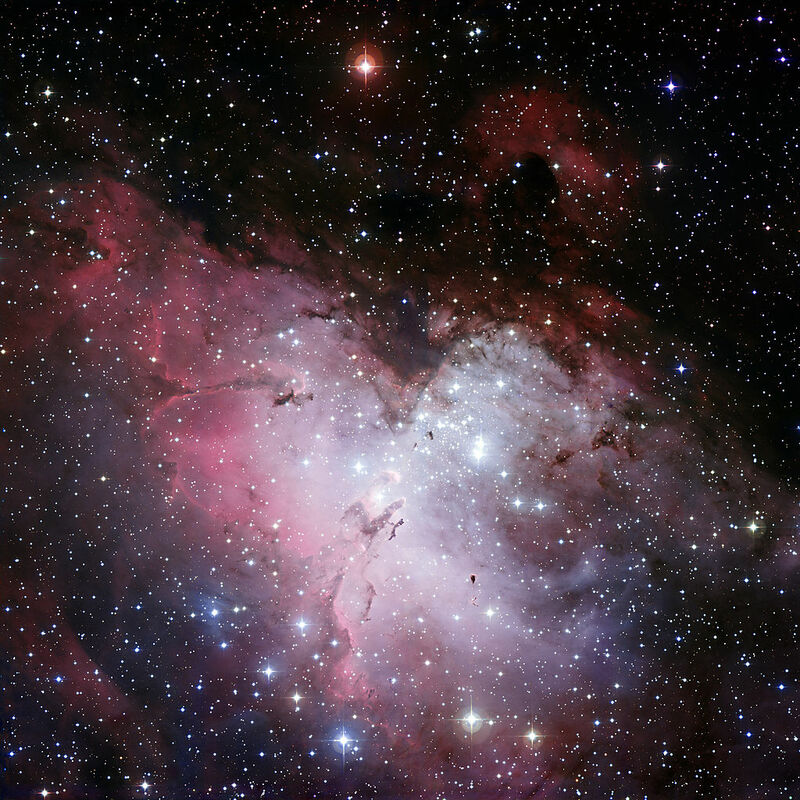 Which is your favourite binocular Messier? I’m chasing Messier objects with binoculars at the moment. To be honest most aren’t all that impressive, but whilst searching out these objects in Ophiuchus I encountered something fabulous. I found a huge cluster of bright stars with an obvious profusion of faint stars forming the background field. It immediately struck me that after a lean time on Messiers this object was what binoculars were made for. As usual I let the field wander around only to catch sight of an even more impressive cluster. This one wasn’t as big, that much was immediately evident, but it sported a bright band of stars from north to south through the middle of a rich cluster. 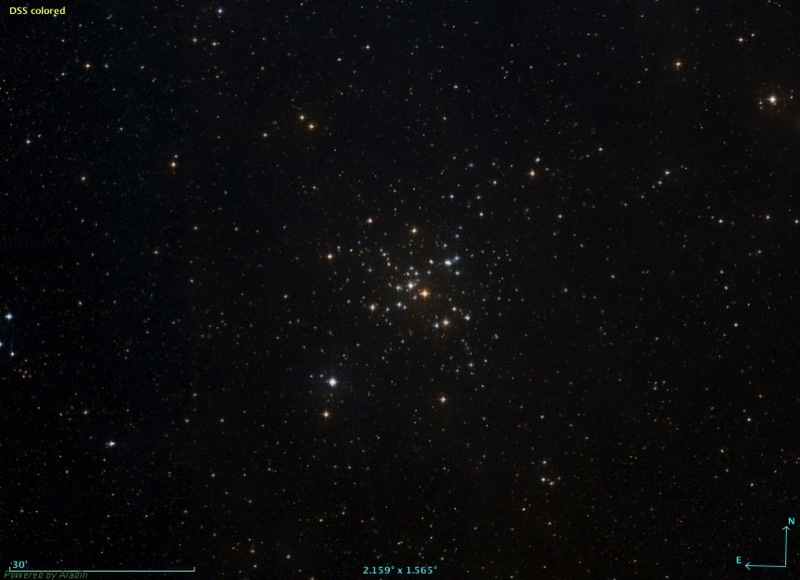 A quick look at my copy of Sky & Telescope’s Pocket Sky Atlas told me that what I had originally found was the open cluster IC 4756, and that I was now gazing upon the splendour of NGC 6633. Here’s an idea of what they look like provided by Carte du Ciel, but it’s nothing like the real thing. 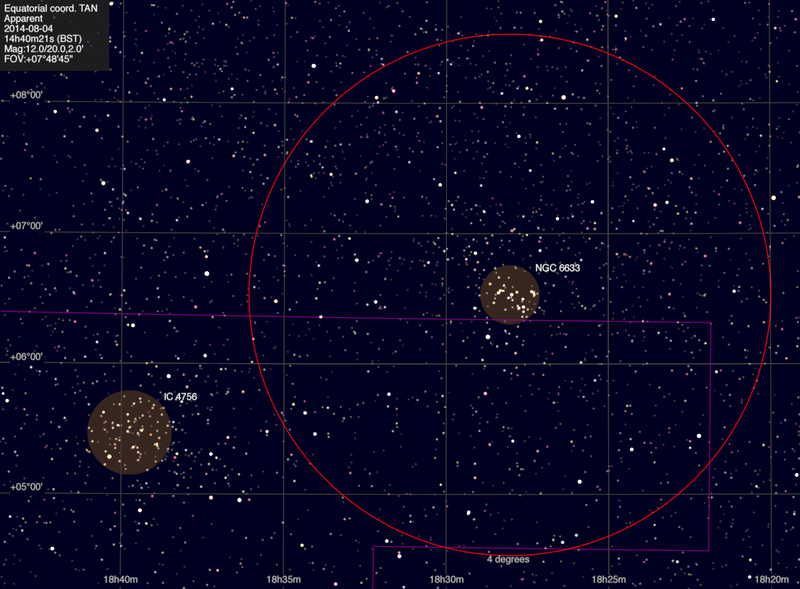 The red circle around NGC 6633 shows a 4 degree field of view which is pretty modest for moderate power binoculars. My 15×70 binoculars have about this field, and my 10x50s give about 5 degrees. So you can see why these are such good binocular objects. First they’re a bright starry magnitude 4 to 5, and secondly they’re really big, I would guess at least a degree across. They’re not particularly hard to find either. There are plenty of bright stars around to help and binoculars are great for star hopping. 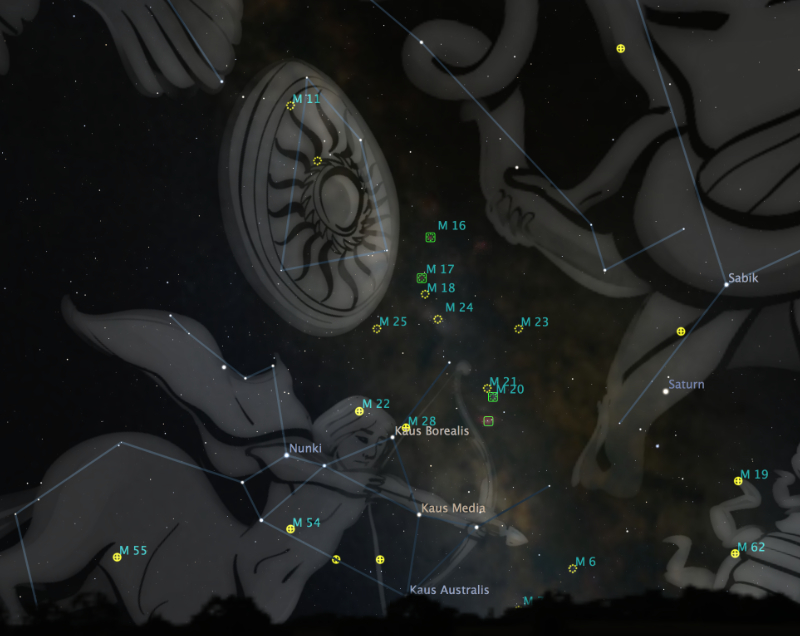 Here’s a sky map courtesy of Stellarium to help. You’re missing out if you haven’t seen these two, so if you’ve got a pair of binocular take a look before they disappear into the morning glare until next year.